Barbara Ehrenreich's Nickel and Dimed explored the lives of low-wage workers. Now, in Bait and Switch, she enters another hidden realm of the economy: the shadowy world of the white-collared unemployed. Armed with a new identity and a plausible résumé of a professional "in transition," she attempts to land a middle-class job -- undergoing career coaching and personality testing, then trawling a series of boot camps, job fairs, networking events, and evangelical job-search ministries. She gets an image makeover to prepare for the corporate world and works to project the winning attitude recommended for a successful job search. She is proselytized, scammed, lectured, and -- again and again -- rejected. 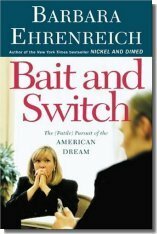 Bait and Switch highlights the people who've done everything right -- gotten college degrees, developed marketable skills, and built up impressive résumés -- yet have become repeatedly vulnerable to financial disaster, and not simply due to the vagaries of the business cycle. Today's ultralean corporations take pride in shedding their "surplus" employees -- plunging them, for months or years at a stretch, into the twilight zone of white-collar unemployment, where job-searching becomes a full-time job in itself. As Ehrenreich discovers, America's middle class is now the loser in a classic game of bait and switch, in which the promise of upward mobility and financial security has given way to a harsh reality of limited social supports for newly disposable workers -- and no guarantees even for those who have jobs. Alternately hilarious and tragic, Bait and Switch, like the now-classic Nickel and Dimed, is a searing exposé of economic cruelty where we least expect it.